Microvision’s Positioners are three axis mechanical positioning systems designed specifically for the Microvision SS400 Display Measurement Systems. They are offered in a range of sizes to cover small displays up to 93 inch diagonal displays. They feature a robust design that has been perfected over 30 years to provide a trouble-free, accurate and economical package. Microvision’s measurement modules can be quickly and easily exchanged using simple button mounts. You can even add an optional Instrument Platform to hold instruments from other manufacturers. The positioners are designed for quite, smooth and fast operation. The internal bearings are pre-lubricated and the linear bearings and precision rails require no lubrication for maintenance free operation. The power supply and the drive and interface electronics are packaged into the base of the stage resulting in a clean, uncluttered work area with only the power cord and interface cables visible. The MV software provides both automatic and manual position control. Complete test sequences are enabled when using the positioner to provide auto focus, orientation and position,horizontal and vertical translation. The software also provides simple functions such as Home, Goto, Zero, Seek to Pixel, and Auto Focus. In the standard vertical position, the positioners provide a small space requirement. An optional conversion package allows the positioners to be mounted horizontally for measurements on displays in the horizontal position. For accurate measurements, the DUT should be positioned normal and at a certain working distance in front of the test system. Microvision offers the following positioning tables to provide an easy way to locate and align the display under test (DUT) to the test system. The ZM-1 table allows the user to easily move the display under test relative to the measurement system. With the optional absolute digital metering system (ZM-1-Dig), the UUT can be accurately positioned at a fixed distance away from the testing apparatus in either metric or English units. The ZM-1 table can be used with the TM-1 table to provide three axis adjustment, which is very useful when making measurements of flat panels where the alignment is critical for tests such as the ISO 13406-2 & ISO9241-3xx. 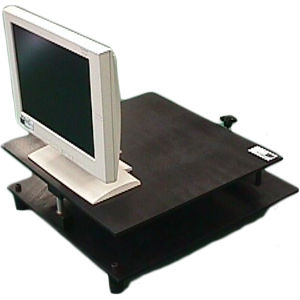 The TM-1 Display Positioning Table is designed to provide easy alignment (pitch and yaw axis) of the display under test relative to the test system. The TM-1 table can be used with the ZM-1 table to provide three axis adjustment, which is very useful when making measurements of flat panels where the alignment is critical for tests such as the ISO 13406-2 & ISO9241-3xx. ** SS60/SS70/SS90 Stepping Resolution is larger in Horizontal Axis and Speed is Faster.